This is the first in a series of collections of fiction and nonfiction about Florida by legendary writers who came here—some to escape the chilly North, some to find freedom, and some to investigate what the fuss was all about. From Audubon in 1834 to Dave Barry in 1990, these writers reveal Florida’s natural beauty and her residents’ human foibles. In poetry, John Greenleaf Whittier exposes our shameful slave-holding past, and Elizabeth Bishop extols our turtles and sandbars and tropical rain. Jules Verne shoots a moon rocket off from Tampa, and Hunter Thompson delivers up his own gonzo brand of journalism in a story of marine salvage in the Keys. Hemingway rants about the government’s laxity in the face of tragedy, while Harriet Beecher Stowe offers some advice on the time-honored practice of buying land in the Sunshine State. Most Americans only think of theme parks when they think of Orlando. But the city has a rich history as a cattle center--complete with rustlers--the nation's citrus center, and finally the top tourist destination in the United States. This book captures the spirit of a town that began with log cabins and slowly grew though become a major city. The book tells the story of what was once known as the Magic City. U.S. Presidents have played a major role in shaping Florida, whether waging wars, protecting the environment, seeking votes, or just drawing media attention to the state attractions. Andrew Jackson came to fight Indians. Abraham Lincoln came up with the plan to get Florida back into the Union in 1864 to help his reelection chances. Ulysses S. Grant came to promote steamships on the St. Johns River. Regular visitors have included Calvin Coolidge, Herbert Hoover, Franklin Roosevelt, Richard Nixon, and John F. Kennedy. Harry Truman had a house in Key West. 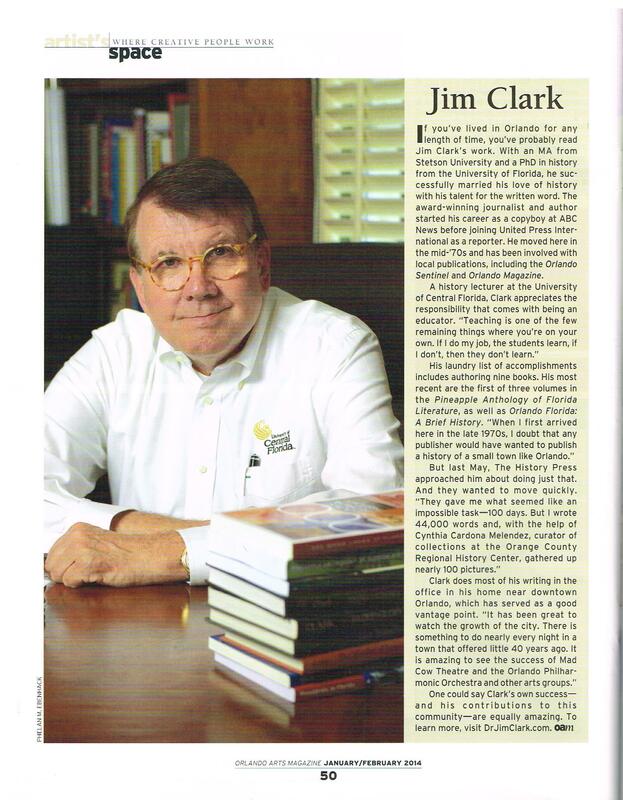 Jim Clark was born in Washington, D.C. He began his journalism career with ABC News in Washington as a copyboy before joining United Press International as a reporter. He worked for the Columbia (S.C.) Record, Tampa Tribune, Orlando Sentinel, Raleigh News & Observer and for the Associated Press in Charlotte and Philadelphia. He has been honored with the George Polk Award, Numerous awards from the Florida Society of Newspaper Editor, The Gerald Loeb Award and the Sigma Delta Chi Award. He is a graduate of Lenoir-Rhyne College, received his M.A. from Stetson University and holds a doctorate from the University of Florida. He joined the history faculty at the University of Central Florida in 1987. He is the author of six books and has written for The Washington Post, Washington Star, Washington Monthly, The Nation, and Miami Herald.